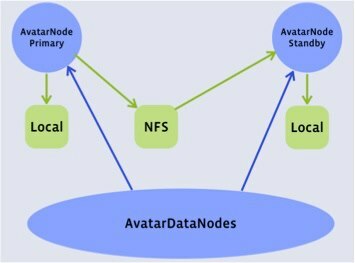 For those unfamiliar with the availability problem Facebook solved with AvatarNode, here’s the 10,000-foot explanation: The NameNode service in Hadoop’s architecture handles all metadata operations with the Hadoop Distributed File System, but it also just runs on a single node. If that node goes down, so does, for all intents and purposes, Hadoop because nothing that relies on HDFS will run properly. AvatarNode isn’t a panacea for Hadoop availability, however. Ryan notes that only 10 percent of Facebook’s unplanned downtime would have been preventable with AvatarNode in place, but the architecture will allow Facebook to eliminate an estimated 50 percent of future planned downtime. Facebook isn’t the only company to solve this problem, by the way. Appistry (which has since changed its business focus) released a fully distributed file system a couple years ago, and MapR’s Hadoop distribution also provides a highly available file system. In Apache Hadoop version 2.0, which underpins the latest version of Cloudera’s distribution, the NameNode is also eliminated as a single point of failure. Amazing to see this technology is full use. Ryan’s done a great job at the conference clearly. Would you even have a clue what Ryan is talking about or are you leaving this comment just for the sake of it? Why would they develop something that scales to that level with just a single point of failure and then leave it to end users to provide a work around? Surely this would be feature requested and developed as a core feature? Avatar was a creation by James Cameron? Are you really that dense?